Imagine how cool it would be if a small town in the Adirondacks could once again host the world’s greatest winter sporting event!? Well, according to this Facebook page – that could be a reality in 2018! As if that wasn’t enough to get you excited, you can also win a t-shirt and a 24 hour trip to visit the Olympic sights in Lake Placid! All you have to do is become a fan of the Facebook page and they will track your IP address and match that with your mailing address. Wow! Sounds fantastic doesn’t it? Any maybe a bit… silly? Now, don’t get me wrong. I was raised to believe that if I read something on the internet, then it must be true. But still, I can’t shake the feeling that something about this Facebook page just doesn’t seem right. I can’t quite put a finger on it, but maybe it is because they spelled ‘comittee’ wrong in their Information Box? No, that isn’t it… that could be an honest mistake. Hmmmm, maybe it is because the logo they are using is almost exactly the same as the logo for the Garmisch Partenkirchen (GAP) 2011 Ski Event? Eh, I suppose it is possible they paid the same designer and got similar work. The GAP 2011 Logo, look familiar? Oh wait, now I know why this all seems a little “off” to me. It is because the bidding for the 2018 Olympics has been over for several months and only 3 cities actually submitted bids. Those cities are: Annecy, France; Munich, Germany; and PyeongChang, South Korea. 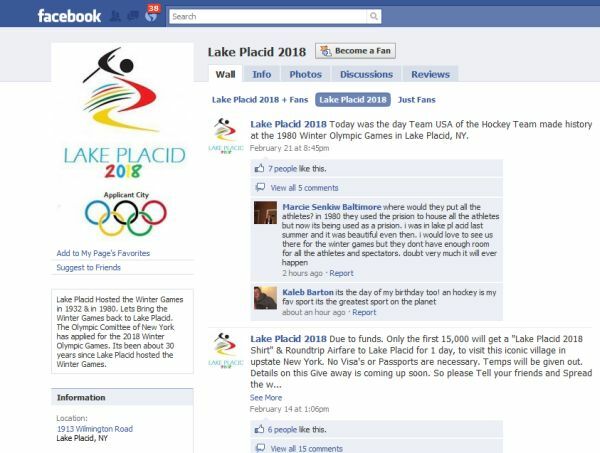 So, as much as I hate to disappoint the 1,718 fans of that Facebook page, no… Lake Placid will not have a shot at the 2018 games and no… you will not be getting a t-shirt or a 24-hour trip to the Adirondacks. It is a hoax. Albeit a well crafted hoax that someone obviously put some effort into… so don’t feel too bad if you fell for it. Athlete Accommodations, can you imagine the APA approving this? Y’ouch, that was some sloppy posting on my part. Thanks for the correction. Same here… more and more of my friends are signing up, one even “invited” me to it. Ugh! The Games are so much larger now than they were in 80… look at the amount of medals handed out compared to now. All the snowboard events, freestyle skiing, curling, short-track, skeleton, women’s hockey… I’m probably forgetting others. Placid is waaaayyy too small for a modern Winter Games. Lillehammer 1994 will go down in history as the last “small-town” games, and even then, they have 20,000 population. The IOC rejected the thought of a Lake Placid/Montreal bid, so now we’re pretty much stuck having to piggyback on… uh… Albany? 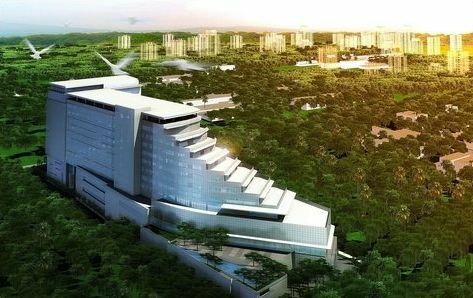 OMG – it has now moved to 2022 and has 12,000 fans! It’s not so much the fact there’s a page to promote a Lake Placid bid, but how this guy is still insisting on making “official” pronouncements and pretending he’s the (non-existent) “Olympic Comittee [sic] of New York”. Changing it from 2018 to 2022 makes the hoax a little less obvious, but still. I’m sure dozens of people have hit “Report this Page” on Facebook, but still no action. Facebook is going downhill now that all the MySpace kids are flocking to it. Ok, I am now temporarily ‘blocked’ from facebook for posting the link to this post on several of the entries on that page! Blocked from the entirety of Facebook??! the page cleary is real. The New York Olympic Campaign is a Non profit group organization that works in promotin the olympics to be held in New York State. LOL… yes, it “cleary [sic] is real”. Because there’s fancy logos and sketches and stuff. And it’s on Facebook. It must surely be true. There’s no such thing as the New York Olympic Campaign, or a “non profit group organization” for that matter, either. No need to be angry here. You’ve already fooled 13k+ people, despite the efforts of several who’ve pointed out the holes in your little story, so you’ve already “won”. But you’re delusional if you truly believe you can manage to fool those of us who live in and around Lake Placid and are intensely familiar with the dealings of the APA and ORDA. 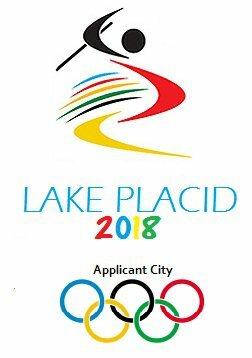 If you’re NOT the hoaxer yet truly believe, as per that hoax, that ORDA’s bid “for the Lake Placid Winter Games for 2018 was voided under the terms of the IOC Due to Late entry” – which isn’t even close to how the bidding process works, never mind the sheer absurdity of this ever happening anywhere – then, uh, I’m sorry. NYS Olympic Regional Development Authority and pointed them to that facebook page. They will either confirm that as correct, and if not, they are the ones that can have that page removed. time will tell, either way. Wow, this is out of control. I keep waiting for it to die down and then it just… keeps… going. My question is WHY? What’s the point of perpetuating a stupid rumor like this? Whoever is behind it is only going to look like even more of an idiot in the end. Guess it’s fun for him (or her) for now. Can you all do a favor and pass this around? Nice job getting confirmation from ORDA. The whole thing is so ridiculous on its own that I didn’t even want to bother — but maybe you’ll have nudged them toward having that page removed. If Facebook can ignore thousands of individuals reporting the page, maybe they won’t ignore the legitimate organization. I am really surprised that Facebook is ignoring this, given how many people have ‘reported’ it and given The President of ORDA’s own denial of this. The owner of that page has been deleting my posts with that Email from ORDA though. He/she doesn’t want others to know. He’s trying really hard now… giving out two different dubious Manhattan addresses and referring to those calling him out as “haters”. It’s depressing to see how many people have apparently accepted this additional meaningless verbiage as proof that he’s legit. As if once you’ve produced a sufficient amount of bull$#^t, people will accept it. Ehh. Now this facebook page is promting lake placcid 2022!